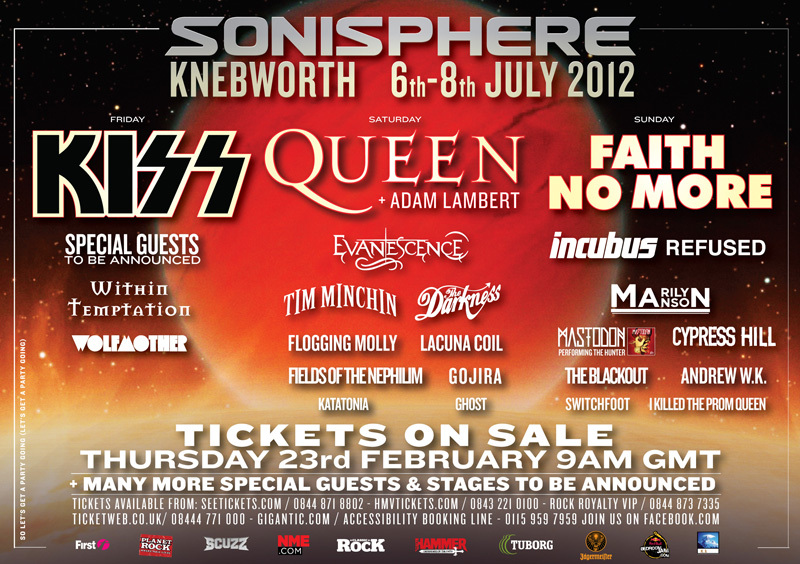 Sonisphere Knebworth have announced that Queen will headline this year’s festival and will perform an exclusive set with Adam Lambert on vocals. Kiss (European exclusive) and Faith No More (UK exclusive) have also been confirmed to headline with Tim Minchin being the top comedy name this year. Other names appearing this year are the reunited Refused, Within Temptation, Wolfmother, Evanescence, The Darkness, Flogging Molly, Lacuna Coil, Fields Of The Nephilim, Gojira, Katatonia, Ghost, Incubus, Marilyn Manson, Mastodon (performing their latest album ‘The Hunter’ in full), Cypress Hill, The Blackout, Andrew W.K., Switchfoot and I Kill The Prom Queen. Special guests are to be announced for the Friday night when Kiss headline the festival. The current day splits can be viewed below in the poster.